Note Synth is a fun musical app to use with MIDI Mobilizer from Line 6. It is a pitch to MIDI note converter that can convert the note you are playing into MIDI information that can be recognized by MIDI keyboards or sound modules. Want to play your favorite synthesizer riff on your guitar? Simply plug your guitar into an iPhone, iPod or iPad and plug the MIDI Mobilizer output into a keyboard or sound module MIDI input. This is very similar to a guitar synthesizer at a fraction of the cost! You can also have a MIDI keyboard/synthesizer track your voice or other instrument. The audio input signal can come from the built-in microphone, the headset microphone or through an audio input cable. As long as the input is a single note (no chords) Note Synth will recognize it and output the correct MIDI note message. Keep the last and current note sustaining while you play the next note. This keeps the last three notes playing at once. Make sure your instrument is in tune. MIDI note values are aligned to the chromatic scale. In-between notes cannot be played. Low notes are hard for Note Synth to recognize. Instead, play higher notes and adjust the MIDI output to be one or two octaves down. 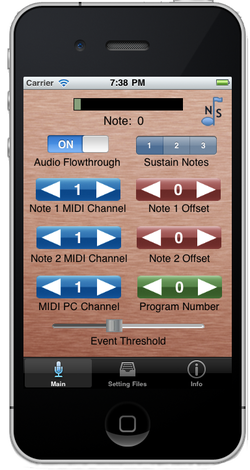 Note: There is a small amount of latency from when a note is played, recognized and output through the MIDI mobilizer.